PopUp for Change brings teens together to transform urban spaces into vibrant PopUp hair salons, food trucks, and supper clubs that tackle issues of social justice. We use design thinking and Jewish values of social justice to explore, listen and respond to the needs of the community and to make real change in the world. In summer 2017, our teens created a PopUp Hair Salon for senior citizens in need at the Sirovich Center on the Lower East Side. 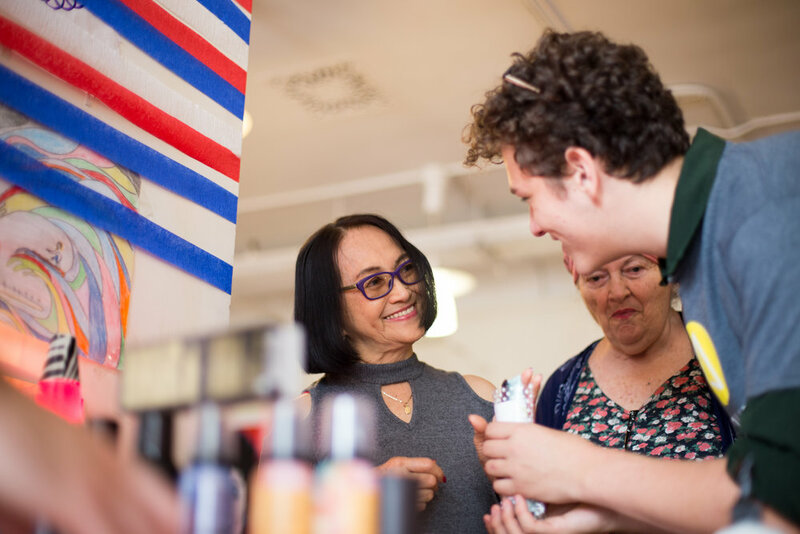 During the two week program that was based at the 14th Street Y in New York City, we provided over 150 haircuts and manicures, served over 200 snacks and danced and played board games as we connected personally with each senior that came to the salon. Our PopUp Supper Club in summer 2016 transformed the evening meal at the Sirovich Center into a lively communal gathering. Our teens collaborated with the chef to prepare dishes that highlighted the diverse ethnic cuisines of the seniors and attendance numbers soared. In 2015, based at Brandeis University in Waltham, Massachusetts, our teens worked with residents of a low-income housing development and local farmers to create and operate a PopUp Food Truck – bringing healthy food options to the community. Read more about us in Tablet Magazine. Ezra Benus is a Community Educator for PopUp. He is a native New Yorker, growing up in Brooklyn and the Bronx. He studied at the Bezalel Academy of Art in Jerusalem, the University of Amsterdam, and got his BA in Studio Art and Jewish Studies at CUNY Hunter College. He recently completed the Jewish Studies Fellowship at Paideia Institute in Stockholm, Sweden. During summertime Ezra teaches art to high school students in Brandeis University's BIMA arts program. From paintings, sculptures, to performance art, Ezra's work engages with social and cultural assumptions revolving around the topics of disease/disability and religion. Melissa Shaw is a Community Educator at Pop Up for Change. Melissa is a storyteller, theater maker, and writer and received her MFA from Sarah Lawrence College. Melissa is currently a Teaching Artist with Girl Be Heard, a feminist art organization, as well as with the Community Word Project and this summer she will be teaching at Crossroads Juvenile Detention Center. In addition she is a consultant and trainer for the Anti-Defamation League where she leads anti-bias workshops for students and educators throughout the State of New York. She lives in Brooklyn without a cat. Gadi Paskoff is the program manager at PopUp for Change and the Director of Teen Programming at the 14th Street Y. Originally from Lancaster, PA, Gadi, recently graduated from American University. In college, Gadi began the first ever community day, organizing 400 college students from five organizations to 20 sites around D.C to tackle social justice issues. After college, he was in a fellowship with Temple Sinai in Washington, D.C. where he designed and taught programs for children of all ages. Gadi spent five summers working at URJ Camp Harlam as a counselor and Unit Head. Tirtzah Bassel is PopUp’s founding director and senior educator. As an artist and educator, Tirtzah believes in the power of creativity to transform perception and bring real change in the world. She is also Assistant Director of BIMA Summer Arts Program at Brandeis University and has worked as Senior Educator at The Nesiya Institute in Jerusalem. Tirtzah received her Master’s degree in Fine Arts from Boston University and has exhibited her work nationally and internationally. Her site-specific duct tape installations, paintings, and drawings engage with political and social realities. At PopUp for Change teens tackle issues of social justice using design thinking—an approach to problem solving that promotes empathy and applies an iterative approach to generating creative solutions. 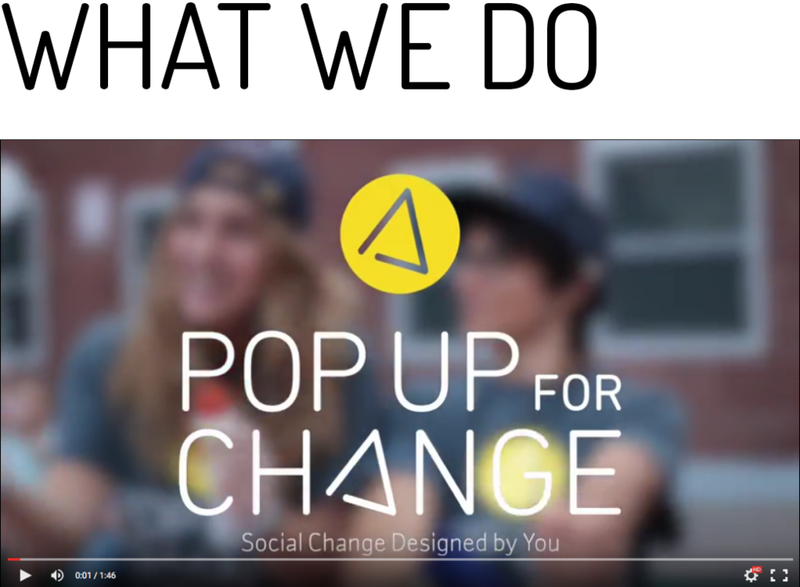 To learn more about PopUp for Change and get updates on our free workshops please enter your information below and follow us on Instagram and Facebook. PopUp for Change has decided to suspend its programming for the summer of 2018, please check back with us for updates on future programs.